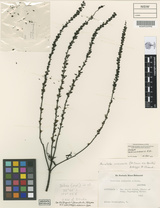 Veronica arenaria A.Cunn. ex Benth. Description: Woody herb or softly woody shrub with several erect, sparingly branched stems from a small woody rootstock, stems 30–100 cm high with short, rigid, antrorsely curved hairs mainly in longitudinal bands; stems usually dying back to base after fruiting. Leaves linear and entire or with a few teeth or with spreading irregular linear lobes, acute, 2–5.5 cm long, 1–3 mm wide (excluding lobes which are to 8 mm long and 1.3 mm wide), glabrous except for short antrorsely-curved papillose hairs on margins; sessile. Racemes mostly 20–35 cm long, 50–100-flowered. Calyx lobes 4–10 mm long and 1–1.5 mm wide in fruit, margins with sparse very short hairs. Corolla 7–10 mm long, bright violet-blue. Capsule broad-obovate, 3.5–6 mm long, 2.5–3.5 mm wide, emarginate, with short hairs on upper margin, slightly glossy. 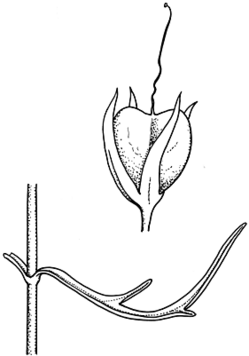 Distribution and occurrence: Grows on rocky slopes and river flats, in sandy soils, often in eucalypt woodland; western edge of tablelands and Slopes, north from Mendooran.